SCI Sharp Controls is a distributor for Milwaukee Cylinder in North and South Carolina, Georgia and Virginia. 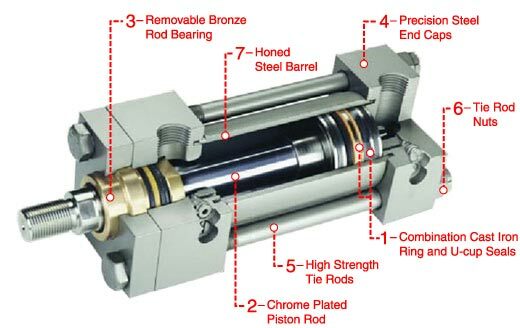 SCI carries pneumatic cylinders, low pressure hydraulic cylinders, heavy duty hydraulic cylinders, and metric hydraulic cylinders manufactured by Milwaukee Cylinder. 1. Piston - unique combination of cast iron rings and rubber u-cup seals, effective at low and high pressure. Excellent load holding and greater reliability with low maintenance. 2. Piston Rod - hard chrome plated/polished high strength steel. Held to tight straightness standard. Long seal and bearing life with lower maintenance cost and smooth operation. 3. 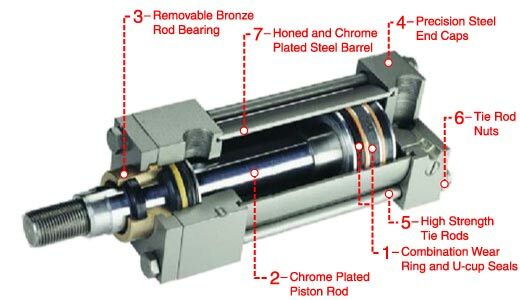 Piston Rod Bearings - bronze designed for maximum length, externally removable. Resists side load and increases seal life resulting in less downtime. 4. Tie Rods - constructed from high quality medium carbon steel. Have roller threads. Extended cylinder life. 5. Cylinder Barrles - honed/held to tight standards for roundness and straightness. Sealed with o-rings and piloted on O.D. Increasing pressure reduces extrusion gap. Optimum seal performance with reduced maintenance and smooth operation. The flange and tie-rod mounts are basically the same, except that the cylinder tie rods are extended and used to mount the cylinder. To prevent misalignment, sagging or possible binding of the cylinder, the free end should be supported. The best use of tie-rods when extending on the blind end is in a thrust load application. When using tie-rods extended on the rod end, the best application is a tension load. Tie rod mounts are suited for many applications, but it should be noted that they are not as rigid as the flange type of mounting. The flange mount is one of the strongest, most rigid methods of mounting. With this type of mount there is little allowance for misalignment, though when long strokes are required, the free end opposite the mounting should be supported to prevent sagging and possible binding of the cylinder. The best use of a blind end flange is in a thrust load application (rod in compression). Rod end flange mounts are best used in tension applications. If an application exceeds the rectangular flange rating, requiring an extra heavy flange, a solid flange style end cap mount is available at no extra cost for most bore sizes. When a less rigid mount can be used and the cylinder can be attached to a panel or bulkhead, an extended tire rod mounting could be considered. (Pictured: Milwaukee Cylinder Side and Lug Mounts: Tapped Holes in Caps Flush - Model H41, Side Lug - Model H42, Foot - Model H43, Centerline Lug - Model H51). The side or lug mounted cylinder provides a failrly rigid mount. These types of cylinders can tolerate a slight amount of misalignment when the cylinder is at full stroke, but as the picton moves toward the blind end, the tolerance for misalignment decreases. It is important to note that if the cylinder is used properly (without misalignment), the mounting bolts are either in simple shear or tension without any compound stresses. (Pictured: Milwaukee Cylinder Pin and Trunnion Mounts: Clevis - Model H61, Rod End Trunnion - Model H71, Blind End Trunnion - Model H72, Center Trunnion - Model H73). 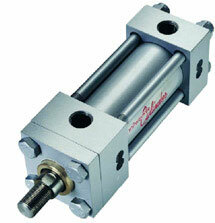 All pin and trunnion cylinders need a provision on both ends for pivoting. These types of cylinders are designed to carry shear loads and the trunnion pivot pins should be carred by bearings that are rigidly held and closely fit for the entire length of the pin. The Milwaukee Key Mount retainer plate is a mounting option designed to add rugged stability to foot and side mount cylinders. The retainer plate is extended below the mouting surface of the cylinder. This extension may be fitted ino a milled keyway in your mouting pad, eliminating the need for welded keys or locator pins. 1. Piston - combination of wear ring and rubber u-cup seals, zero leakage. Excellent load holding and resists side load. 4. End Caps - precision machined steel, assures accurate mounting and alignment. Trouble-free installation and extended service life. 5. Tie Rods - constructed from high quality medium carbon steel. Extended cylinder life. 6. Cylinder Barrles - honed and chrome plated/held to tight standards for roundness and straightness. Optimum seal performance with smooth operation. 1. Piston - unique combination of cast iron rings and rubber u-cup seals, effective at low and high pressure. Excellent load holding with greater reliability and low maintenance. 5. Tie Rods - constructed from high quality medium carbon steel - have roller threads. Increased product reliability. 6. Tie Rod Nuts - self locking with stronger assembly. Increased product reliability. 6. Cylinder Barrles - honed, held to tight standards for roundness and straightness. Sealed with o-rings, piloted on O.D. increasing pressure reduces extrusion gap. Optimum seal performance with smooth operation.